N.J. Ember has read 5 of 40 books. N.J. Ember read 22 books of her goal of 20! 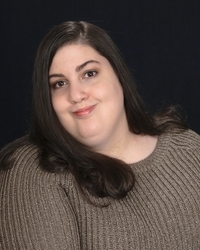 N.J. Ember is a paranormal fiction author who loves to write stories about survival and triumph over adversity. Whether her characters are dealing with the paranormal or everyday life, she seeks to show that strength is not always about being superhuman or invulnerable. She enjoys anything with mystery, suspense and horror, so when she’s not writing you can find her watching shows like Orphan Black, Penny Dreadful and Sherlock. She currently lives in Michigan with her grandpa and a forever growing collection of books and Funko Pop! figures. Also writes as Nadia Hasan. To ask N.J. Ember questions, please sign up. We’d love your help. Let us know what’s wrong with this preview of Blood Echo by Christopher Rice. We’d love your help. Let us know what’s wrong with this preview of Relics and Runes by Heather Marie Adkins. “What the hell is going on?" demanded Kami's dad, advancing with his black eyes snapping. Jared blurted, "My intentions are honourable." "Well, I mean," Jared said, back against the wall like a cornered animal. "When we're older. I mean-"
“One of the lambs fixed its attention on Jared. “Baa,” it flirted.